Prof. Michelle Leishman is a plant ecologist with a special interest in climate change. She is head of the Department of Biological Studies at Macquarie University. On Saturday 24th November she gave us a talk on urban greening. She heads a team trying to make life more comfortable as climate change heats up our urban areas and our population density increases. It is known that 70% of Australians live in urban areas. In hot weather heavily populated city centres, with high rise buildings and large paved areas, heat up more than outer suburbs, where buildings are spaced further apart and there are larger areas of garden and parklands. Heat sensors show that even in median strips with vegetation and rows of street trees temperatures are lower than over the adjacent roads. Urban green spaces can be home gardens and public parks, street trees and retained areas of bushland. These help to absorb water run off during heavy rain and reduce the ambient temperature on hot days. But what can be done in areas of high building density? Interest is growing in roof top gardens. Greening the roof of a building has many advantages. It has been proven that such a building has lower power costs for both cooling and heating. The roof area absorbs storm water and can collect rain water to maintain the roof top garden. Plants help clean the air by absorbing CO2 and also collecting particulate pollutants, reducing the prevalence of illnesses such as asthma. Green spaces and gardens are good for relaxation and increase feelings of wellbeing in people. Solar panel efficiency is reduced in high temperatures, so planting greenery under them improves their efficiency. It is also possible to produce green walls with plant containers connected to a watering system set between windows and the levels of the building. These are harder to build and maintain than roof top gardens. Developers are being encouraged to incorporate a roof garden in the design of new high-rise buildings. The initial building costs are obviously higher. Depending of the size and scope of the roof garden, the building will need increased structural strength to support the weight of soil and water. Ideally there should be a water storage system to collect water running off the garden, whether from rain or artificial watering. This reduces the use and cost of town water for maintaining the garden. To balance the extra structural and building costs, there is the saving in the cost of power for air conditioning. It is also known that units in a building with a roof garden can sell for as much as $100,000 more than those with no garden. The developers can recoup the initial higher building costs. Green roofs do not have to be complicated. In Europe, they can be flat moss gardens. The climate might not allow that here, but a roof covered with tough native grasses would work just as well. Other roof top gardens have beds of shrubs, flowers and vegetables with outdoor seating and areas for social interaction. Even more complicated ones may have garden mounds with soil deep enough for small trees and larger shrubs. Prof.Leishman heads a study called “Which Plant Where”. This study is aiming to produce lists of plants suitable for greening roofs and other urban areas. The plants are tested in artificial laboratory conditions and are exposed to increasing heat and periods of drought. 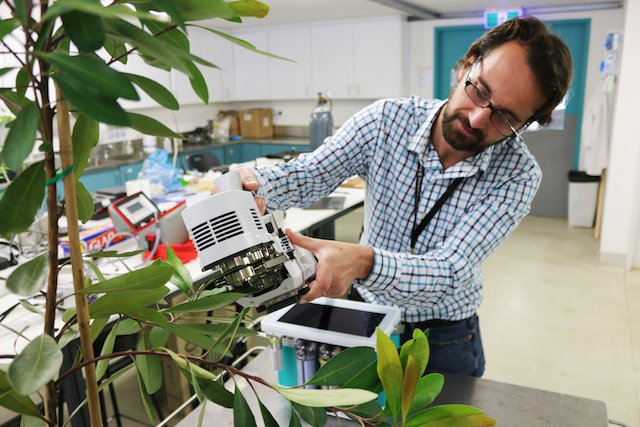 The plants which manage to withstand large alterations in conditions are more likely to survive the climate changes predicted to occur over the next 20 years or more. Recommendations for suitable plants will also be arranged to account for different locations in Australia. The aim of the study is to produce plant suggestions so that new gardens can continue to thrive as the climate changes. This study is progressing well and on completion will be available online and as a phone app. On a fine October day, we met at Wentworth Falls station for a bushwalk to see the spring show of flowers. The Charles Darwin Walk follows the beautiful Jamison Creek south, arriving at the top of Wentworth Falls. The terrain is sandy over Hawkesbury sandstone but with underlying hanging swamp in places. There are also rock platforms with overlying water and bog conditions. The vegetation is varied: woodland on the ridges, lower growing species on the alluvial areas adjacent to the creek and hanging swamp. Some endemic species of the Blue Mountains were identified. We identified 22 species in flower and we probably missed quite a few more. We took a leisurely few hours walking the track, taking great delight in spotting the different flowering plants and trying to identify the species. Plant ID: Pip Gibian et al. Brian gave his usual energetic and spirited presentation on this topic last Saturday. He outlined the parameters of cottage gardens and the type of plants that might be suited to that environment. Then followed a breakdown by plant size and a series of excellent photos of candidate native plants and a discussion of the needs to successfully grow each one of them. Brian’s background knowledge really shone through and he fielded a range of questions from the audience to complete this part of our meeting. “Pollination is the delivery of pollen to the female organs of a plant (stigma in flowers). Pollen is made by the male organs of a plant (stamens in flowers) and contains genetic information needed for plant reproduction. Pollen may be transferred to female organs on the same plant (self-pollination) or another plant of the same species (cross-pollination). As a result of pollination, the plants produce seeds. Pollen can be dispersed by wind, water and animal pollinators such as insects, bats and birds”. Many plants depend on animals, particularly insects, to transfer pollen as they forage. Plants attract pollinators in various ways, by offering pollen or nectar meals and by guiding them to the flower using scent and visual cues. This has resulted in strong relationships between plants and the animals that pollinate them (Australian Museum, 2018). However, a key scientific question that is not easily answered is ‘What pollinates what?’. That question has engaged Michael over the last few decades. It is estimated that there is some degree of specialisation in ~8% of bees. One intriguing example is that of ‘inside out flowers’ such as figs where the male wasps live inside the figs and the female sometimes rips off her wings before visiting the male and incidentally pollinating the fig flower. Pollinators include birds, marsupials, bats, butterflies, moths, wasps, beetles, thrips and bees. The small antechinus pollinates toothbrush grevilleas while various honeyeaters, for example the eastern spinebill, visit Lambertia formosa, many species of Eremophila and some epacrid flora, such as Epacris longiflora. 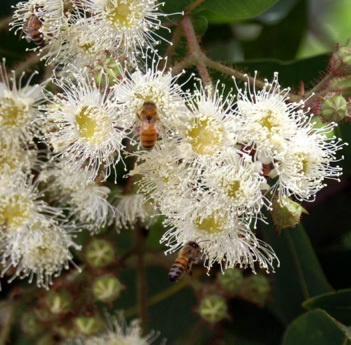 Australia has more than 1500 species of native bees that adopt a variety of methods to harvest nectar from flowers and the flowers themselves have some degree of adaptation to attract pollinators. However, extreme mutualism is rare. In general, if one partner is a specialist, the other is a generalist. “Convergent floral traits hypothesized as attracting particular pollinators have been described as pollination syndromes. 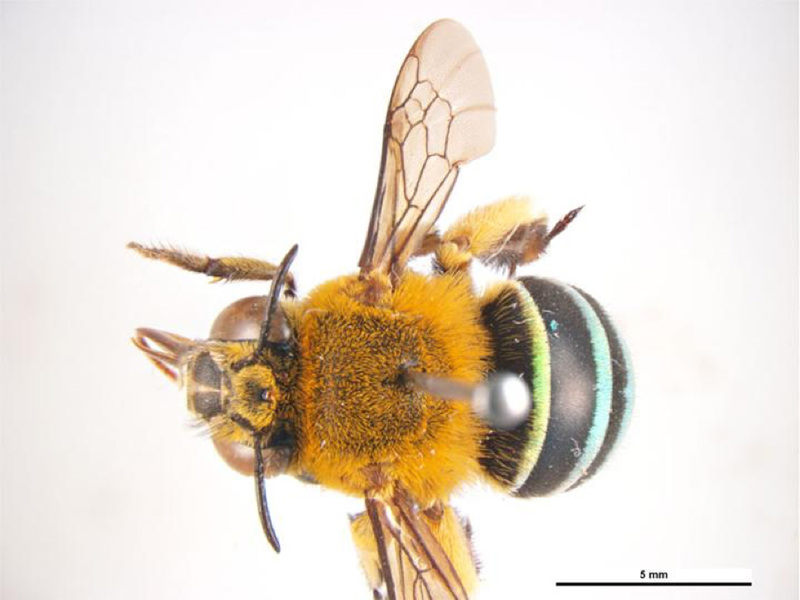 However, the traditional syndromes described by Faegri and van der Pijl (1979) have been shown to be unreliable predictors of major pollinators in some plant communities (Hingston and McQuillan, 2000; Ollerton et al., 2009). The accuracy of these syndromes also differs across plant families (Johnson, 2013). Floral diversity suggests that the Australian epacrid flora may be adapted to pollinator type. Currently there are empirical data on the pollination systems for 87 species (approx. 15% of Australian epacrids). 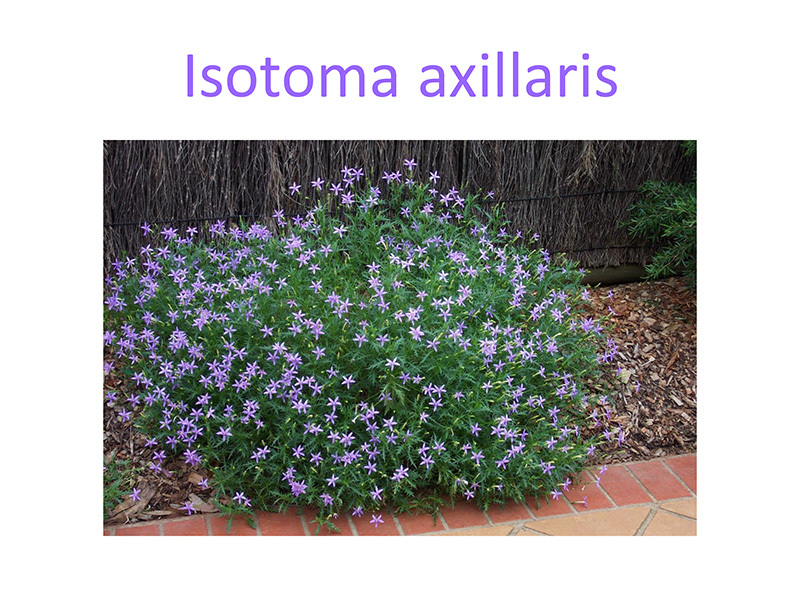 This provides an opportunity to test for pollination syndromes and their important morphological traits in an iconic element of the Australian flora. Floral attributes are correlated with bird, fly and bee pollination. Using floral attributes identified as correlating with pollinator type, bird pollination is classified with 86 % accuracy, red flowers being the most important predictor. Fly and bee pollination are classified with 78% and 69 % accuracy but have a lack of individually important floral predictors. Excluding mixed pollination systems improved the accuracy of the prediction of both bee and fly pollination systems. Although most epacrids have generalized pollination systems, a correlation between bird pollination and red, long-tubed epacrids is found. Statistical classification highlights the relative importance of each floral attribute in relation to pollinator type and proves useful in classifying epacrids to bird, fly and bee pollination systems” (Johnson, 2013). Some species of bee favour pea flowers as they are strong enough to open the keels of the flower to find the nectar and in the process being dabbed with pollen. The blue banded bee is a buzz pollinator that vibrates its head against flowers with poricidal anthers at the rate of 350 times/second to shake free the pollen (Calyx Centre, Royal Botanic Gardens, 2018, https://www.rbgsyd.nsw.gov.au/the-calyx . 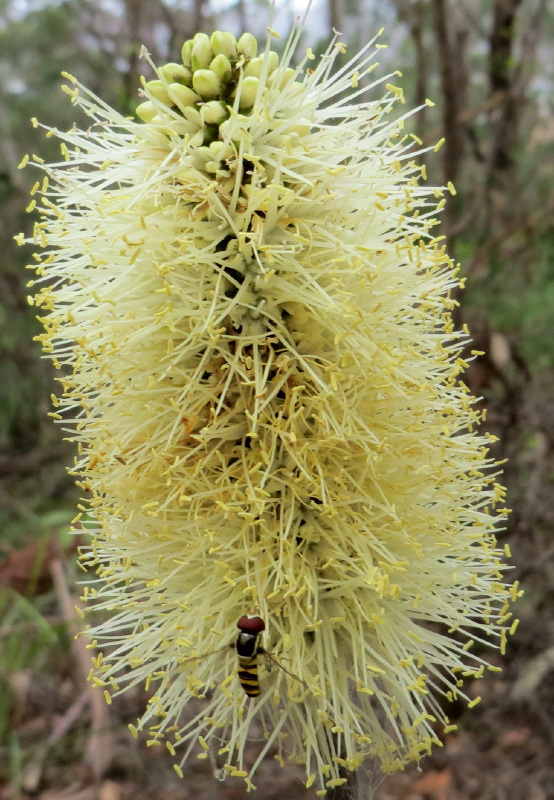 Geebungs - Persoonia species are visited by many different kinds of bee, but a small number of bee species have evolved modified body parts that have helped them become specialist foragers from Persoonia. The frequency of specialisation by flowers is particularly high among orchids. This is possibly because they have evolved symbioses with fungi, which has the consequence that they need to produce large numbers of seeds in order that some land where a suitable fungus is present. 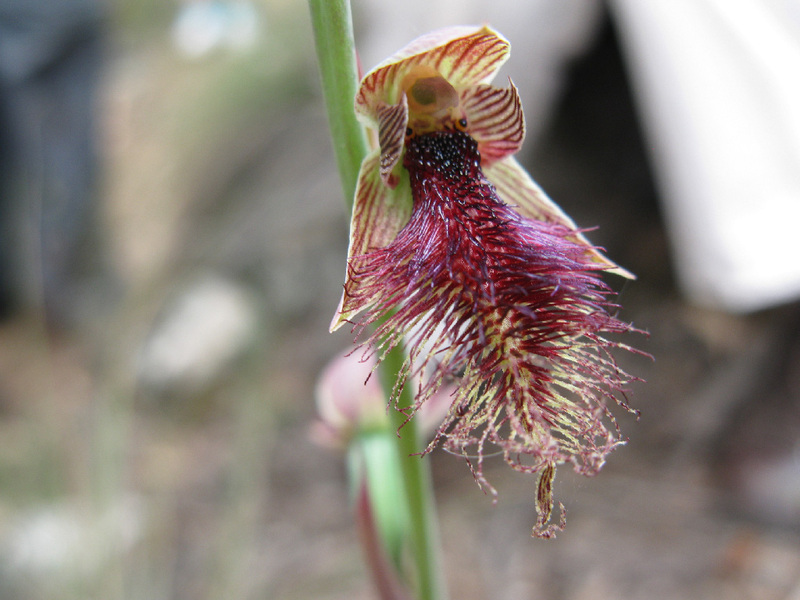 An orchid’s pollen is held in a packet so that all the pollen is removed by a single visitor. This makes narrow specialisation much less hazardous. The mechanisms that have been evolved by orchids are varied and include the use of sexual pheromones to attract male bees and wasps and fool them into attempting to mate with orchid flowers, thereby acting as pollinators. 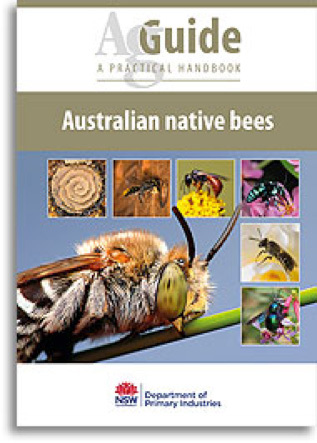 Our summary has attempted to give some flavour of Michael’s fascinating talk but to find out more, one could begin by consulting the publication: Native Bees of the Sydney Region. A Field Guide by Dollin, A., M. Batley, M. Robinson & B. Faulkner (2000). At our meeting on 24th February 2018 we had a great talk by Narelle Happ on native plant foods. As well as being a good communicator, Narelle speaks from experience. She grows almost all the plants she describes, and regularly uses them in her kitchen when feeding her family. As well as plant photos, Narelle illustrated her talk with pot specimens from Sydney Wildflower Nursery, which were sale at afternoon tea. She also brought some delicious food for us to try. It was a warm day and we were greeted with a refreshing lemon cordial flavoured with Backhousia citriodora. At afternoon tea there were muffins made from wattle seed, and saltbush damper with lillypilly jam. During the talk Narelle handed around some delicious Strawberry Gum Bliss Balls, chocolate balls flavoured with ground Eucalyptus olida leaves. In her talk Narelle divided plants by size, trees shrubs and smaller plants including herbs. We learned that only 6 species of Acacia can be eaten, but 2 of them grow locally, Acacia longifolia and A. sophorae (or alternatively Acacia longifolia ssp sophorae). The latter version is much smaller so better suited to suburban gardens. The seeds are roasted and ground into flour. 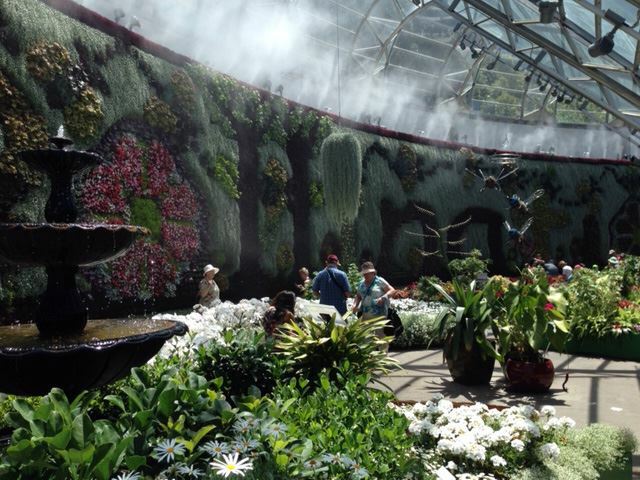 Many food plants are from our rainforests, and happily grow in Sydney’s humid summers, with extra water in dry times. Quite a number of rainforest fruits are edible and delicious. Many grow in shade so can be planted as understory plants. Some are small trees, but Narelle advocates pruning to ensure that fruit can be easily reached. 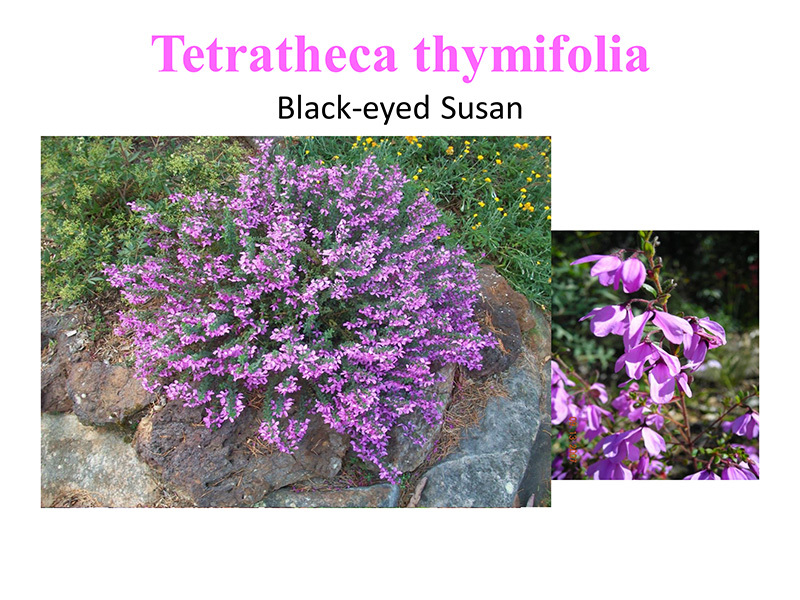 We learned that the leaves of the common Prostanthera species, rotundifolia and incisa, yield replacement herbs for thyme and sage respectively. 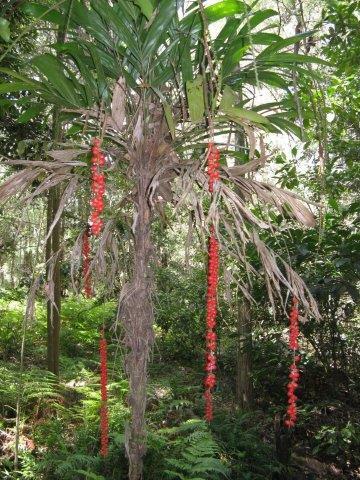 Some Tasmannia species are called Pepper Berry, but the leaves have a much stronger pepper level than the berries. At the other end of the spectrum were the small plants like Mentha, the native mint, and the tubers of the Chocolate Lilly and Bulbine species. Narelle has now sent notes to distribute to members by email. All in all this was a great talk.